The University of Sheffield has begun the tender process for its latest expansion on the Advanced Manufacturing Park (AMP) in Rotherham. 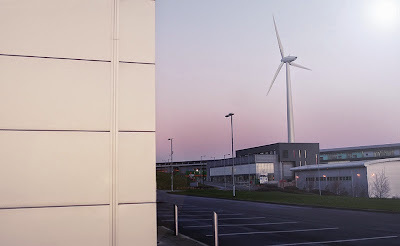 The University of Sheffield Advanced Manufacturing Research Centre (AMRC) with Boeing is a world class centre for advanced machining and materials research for aerospace and other high-value manufacturing sectors. It acquired internationally renowned Cti and Titanium Castings (UK) Ltd, the subsidiary that manufactures castings from titanium alloys, last year. The UK metal casting industry is a key player in the global market, adding £2.6bn a year to the UK economy. The Sheffield city region has a high concentration of foundries and the Cti investment will ensure that the UK's aerospace supply chain can develop new capabilities to produce large thin-walled titanium castings, and win a significant part of the growing global market for these components. The new facility will be able to cast large structural parts with a poured weight of up to 1,000kg. Cti's current facility can make parts of 90kg poured weight. The extension will provide accommodation for new process equipment including a Titanium VAR Skull Melting Furnace, with associated infrastructure and external works. Lighter than steel, titanium can withstand comparable loads better than aluminium, has minimal fatigue concerns, and is highly resistant to corrosion. There is a big opportunity for structural components to replace forgings in airframes and titanium use has been expanded on the Boeing 787 Dreamliner to roughly 14% of the total airframe. The process for large scale, high performance castings is not well researched and The AMRC believes that it offers major opportunities to develop new intellectual property. Called "MEGAshell," Cti's process uses expendable polystyrene patterns which can be machined out of a single block or built up from machined polystyrene parts. Replacing traditional sand moulds, castings can be manufactured to the integrity normally associated with the lost wax process, but of a size and weight far beyond the capability of a process with a pedigree of manufacturing civil aero-engine blades and vanes. German giant, Siemens used the process to make components for industrial gas turbines called "spoke frames." The frames are the first parts of the engine to encounter the exhaust gases after combustion and play a critical part in the engine's performance. Using the technology developed by Cti allowed Siemens to make shapes that were not previously manufacturable. That resulted in a 40% reduction in the spoke frame's weight, minimising manufacturing costs, improving performance and reducing CO2 emissions by 113 kilo tonnes. 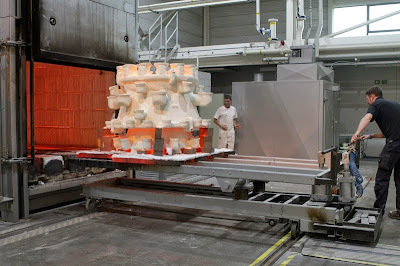 Cti's additive manufacturing technologies have also helped global pump specialist Sulzer create rotating components for use in a major oil pipeline and to create sand moulds using reverse engineering techniques that enabled a company that rebuilds historic cars to recreate the engine of a 1927 Alfa Romeo158. Richard Gould, commercial manager at Cti, said: "Improved performance, reduced energy consumption and lower costs are essential if manufacturers are to be competitive and meet new challenges. "Cti is proud that it has been able to develop the technologies that make that possible for companies ranging from Small and Medium-sized Enterprises to global giants."